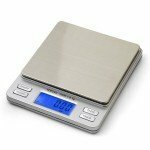 We see a lot of questions what is the best and most accurate kitchen scale and that made us do the kitchen scale reviews so you can see how the top brands are performing. 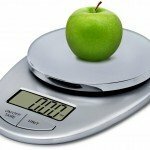 We have found that the most used scales are electronic and digital scales. Like always we only look at the top selling brands and models for the kitchen scales, because we think that buying a better product will result in better results. If you are curious about the prices of the kitchen scales we review click on the picture below to see the prices on Amazon. 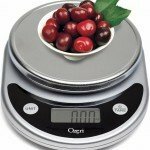 The Ozeri Pronto digital multi-function kitchen and food scale is the top seller in digital kitchen scales on the largest online store in the world and received 4.5 out of 5 star ratings. Runs on 2 triple A batteries that are included and that can be place without using a screwdriver. This Ozeri Pronto can be set to grams, ounces, pounds and kilograms and can weight up to 11 pounds or 5050 grams. This is more than enough to use in any kitchen. This EatSmart Precision Pro had over 7000 reviews and a score of 4.7. Like most other scales it can weigh up to 11 lbs and can display in ounces, pounds, kilograms and grams. The accuracy is 0.05 ounce and that is great for recipes that needs small amount of ingredients. Included are the two AAA batteries it runs on to get started right away. You can weigh items right on the large platform or use a plate in combination with the tare function. The five rubber feet underneath the scale makes it real steady and you don’t have to worry about the scale sliding over the counter or any other surface. The unit keeps it last settings when turned of. Meaning that if you use ounces it will display ounces when you turn it back on. Comes in the colors White, Black, Red, Silver and Chrome to match your kitchen decorum. EatSmart is a very well know brand in kitchen scale and that is something we can see back in the ratings. 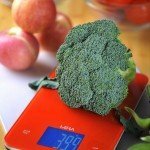 This scale should not be missed in our top 5 digital kitchen scales. With a 4.7 rating from over a thousand buyers we think this Epica TM kitchen scale belongs in the top 5. Like most scales it can weigh up to 11 lbs and displays in ounces and grams and the reading is accurate within 0.05 Oz. Runs on 2 triple A batteries that are included. The Tare option is very important for a scale and the Epica come with this feature. Available in the 2 colors black and silver to match your kitchen decorum. The large display is easy to read and the auto shut off function kicks in after 3 minutes. With a lot lesser people who have rated this Mira Chef’s professional kitchen scale, but a 4.7 it still deserves a place in the top 5. The tempered glass makes this kitchen scale look real nice. Just like to other scale it also reads in ounces and grams. This scale claims to read also fluid ounces and that is new to us so we will try to find out in the in depth review what this feature is all about. the three triple A batteries are included and so it the 2 year warranty. 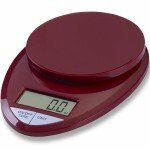 Weighs up to 11 lbs and comes with the highly recommended tare function that every kitchen scale should come with. The 9.5 x 5.9 inches makes this scale to one of the largest we think. Comes in the colors Black, White, Blue, Red, Grey and Brown to find the color that fits your kitchen. 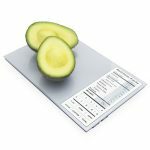 251 ratings and an average of 4.3 might look bad compared to the other digital kitchen scales on this page, but we have a different opinion. This scale offers some other features that the other ones maybe do not offer. This scale can way up to 2 kilogram and that is about 2.2 lbs. This might seem low, but how many times do you weigh over 2 lbs? The feature to hold your weigh will override the auto shut off function till you reset it. The blue back-light got some great ratings. Included are the 2 AAA batteries. With 4 rubber grips at the corners this scale will not slip or slide on any surface. Just make sure that the 5 x 4 inches that is measures is large enough for you. This scale will give you a lot of details about the food you are weighing. Calories, daily values and a lot more. You can read the full Greater Good scale with nutritional fact review here on its own page and read all there is to know. 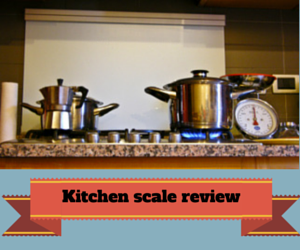 Here are some of the things we look for when we do a digital kitchen scale review. The buttons on the scale should be made in a way that no product can be collected in the cracks. Auto turn timer should be not to short. This is annoying. Digital is all we look at. Analog is not accurate and most of the time bulky. Display should be easy to read in any light situation. Battery life span is also important. Contact us with any question and add your favorite digital kitchen scale in the comments below.